Fans of Native American and South Western-styling will love the Navajo Collection. 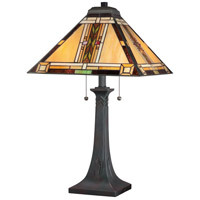 Enhancing its classic design appeal is the understated art glass that is hand-assembled using the copper foil method developed by Louis Comfort Tiffany plus a Valiant Bronze finish. Available in a piccolo pendant, semi-flush mount, pendant, table lamp and floor lamp.